Most of the area’s lodging, including several national chains are within a mile or two of I-95. Right at exit 6 you’ll find the Anchorage Inn, Holiday Inn, Howard Johnson, Susse Chalet and The Port Motor Inn. Just a mile or two east on US Route 1 from exit 6, is the Comfort Inn at Yoken’s. Just off I-95, exit 5 you’ll find a new Courtyard Inn. Downtown Portsmouth has several excellent hotels including The Inn at Strawberry Banke (in the heart of Strawberry Banke Historic District) and the Sheraton Portsmouth Hotel (on Market Street). There are also a number of Bed & Breakfasts too! The Sise Inn (Court Street) and the Martin Hill Inn (Islington Street) are recommended. For fast food, I-95 exit 6 east about a mile to US Route 1, or west the same distance to Newington are the two commercial “hot spots”. All the national chains are located here. Downtown Portsmouth has some of the best restaurants north of Boston, including Banana’s Bar & Grill, and Cafe Mirabelle (Hanover Street), Coat of Arms, and Cafe Meditterraneo (Fleet Street), Dolphin Striker (Bow Street), Molly Malone’s (State Street), The Oar House (Ceres Street), and Porto Bello (Bow Street) US Route 1 south is a great place to get your seafood fix. 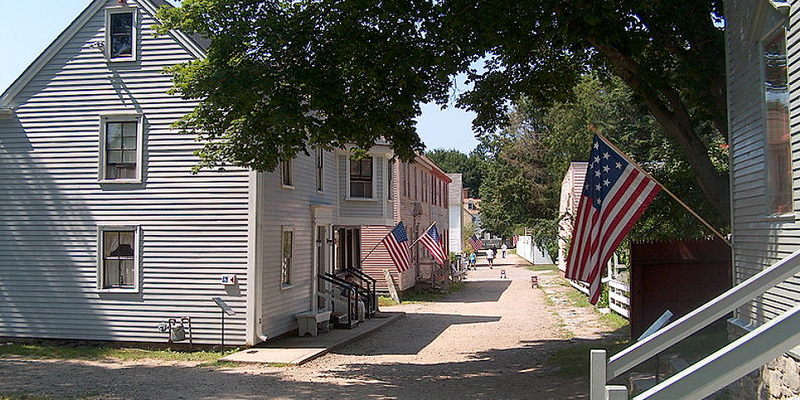 No visit to Portsmouth is complete without seeing Strawberry Banke, the city’s historic seaport area. The Portsmouth Trail, is a walking tour of the waterfront, downtown and the “south end”. Portsmouth Harbor Cruises (Ceres Street dock) offers 1.5 and 2.5 hour trips around the 14 islands of Portsmouth Harbor and the Isle of Shoals. If you need something to do a little more daring, check out Water Country, New England’s largest water park (3 miles south of Portsmouth on US Route 1), with inner-tube rides, wave pool, whitewater rapids and 8 waterslides! If shopping is your question, Newington is the answer. From I-95, exit 6, take the Spaulding Turnpike west two miles to Newington, the regions largest commercial shopping area and home of The Fox Run Mall, and dozens of other shopping centers and major stores. Portsmouth is accessible from I-95, exits 3-7. The Portsmouth Traffic Circle (exit 6) is actually the hub where everything originates. East of the circle is US Route 1 south and the beaches. West of the circle (Spaulding Turnpike) is Newington and plenty of tax-free shopping. I-95, exit 7 (Market Street) takes you right into the city of Portsmouth. Need more? Try these links for additional information about Portsmouth, New Hampshire. Website for Water Country USA, New England’s largest water park! An excellent online visitor’s guide all about the city of Portsmouth.